States with capital punishment are increasingly resorting to state secrecy laws as they are finding it harder to procure the lethal injection drugs they need. At least fourteen states have passed or tried to pass rules keeping the names of lethal injection suppliers confidential. Some states, such as Georgia, define information about the drugs and equipment used in an execution as a “confidential state secret” so that the public prisoners and even courts are prevented from viewing the information. Other states, including Oklahoma, do not designate this information as a state secret but nonetheless, make the information unavailable through litigation. A few states allow litigants to discover the information through litigation, but the state does not need to make the information publicly available. Marijuana and marijuana-derived products are top of mind for state legislatures these days. On March 10, the Virginia state legislature passed a bill legalizing cannabidiol oil, a marijuana-derived product, for patients who suffer from epilepsy. Other legislatures are actively debating measures to legalize cannabis-related products in their states, and many of these legislative proposals would allow cannabis-use for patients suffering from specific medical conditions. Last week, the Alabama state legislature debated a bill that would allow people to take cannabidiol to treat certain conditions, and Utah recently defeated a bill that would have allowed people with certain debilitating conditions to use a marijuana-related extract. As more states pass bills allowing patients to use marijuana-derived products, will state laws clash with federal policies implemented by the Food and Drug Administration (FDA)? Addressing the high cost of drugs was at the top of President Obama’s list in his fiscal year 2017 budget, released last week. Many of his proposals were familiar. The President hoped to increase manufacturer contributions to prescription drug coverage under Medicare Part D and wanted to shorten the length of biologic market exclusivity from twelve to seven years. These proposals were also in the President’s fiscal year 2016 budget but were not put into place. A recent study in JAMA by Dorner, Jacobs, and Sommers released some good and bad news about provider coverage under the Affordable Care Act (ACA). The study examined whether health plans offered on the federal marketplace in 34 states offered a sufficient number of physicians in nine specialties. For each plan, the authors searched for the number of providers covered under each specialty in each state’s most populous county. Plans without specialist physicians were labeled specialist-deficient plans. The good: roughly 90% of the plans covered more than five providers in each specialty. The bad: 19 plans were specialist-deficient and 9 of 34 states had at least one specialty deficient plan. Endocrinology, psychiatry, and rheumatology were the most commonly excluded specialties. Excluding certain specialists from coverage can be a way for insurers to discriminate against individuals with certain conditions by excluding them from their plans. By excluding rheumatologists, insurers may prevent enrolling individuals with rheumatoid arthritis; by excluding endocrinologists, insurers may prevent enrolling individuals with diabetes. Individuals with chronic conditions need to see specialists more frequently than healthier adults, and how easily a patient with chronic conditions can see a specialist can affect his health care outcomes. Does FDA Need a Dietary Supplement User Fee Act? Dietary supplements are dominating headlines these days – and not in a good way. Last Wednesday, Nevada officials found basketball star Lamar Odom unconscious at a brothel after taking cocaine along with ten pills of Reload, a sexual enhancement dietary supplement. That same week, the New England Journal of Medicine released an article finding that dietary supplements lead to roughly 23,000 emergency visits a year. Following these events, some officials have called on the Food and Drug Administration (FDA) to take a stronger role in regulating the dietary supplement industry. Dietary supplements have had a long and storied past. As early as 1973, FDA tried to regulate dietary supplements regarding vitamin and mineral potency. The dietary supplement industry responded by challenging FDA in court, and Congress subsequently enacted the Proxmire Amendment, limiting FDA’s authority to regulate dietary supplements. However, by the 1990s, as consumers increasingly began to rely on dietary supplements, Congress passed the Dietary Supplement Health and Education Act of 1994, expanding FDA’s authority to regulate supplements by enacting special rules related to dietary supplement labeling and manufacturing. Currently, FDA regulates dietary supplements as a special category of foods. Unlike manufacturers of over-the-counter drugs, dietary supplement manufacturers do not need to be registered with FDA and do not need list possible adverse events on supplement labeling. As Joanna Sax points out, this is a major problem because not all dietary supplements are the same. For example, certain weight loss or sexual enhancement supplements often contain chemicals associated with potentially serious side effects while other supplements containing chemicals such as Vitamin C pose less serious safety concerns. Last week, the New England Journal of Medicine published a study finding that smokers using reduced nicotine cigarettes smoked 30% fewer cigarettes and had reduced cravings at the end of the study compared to smokers using standard cigarettes. The lower-nicotine cigarettes had 0.4 mg of nicotine/gram compared to 15.8 mg of nicotine/gram for the standard cigarettes. Commentators were quick to point out that such studies could provide the evidence FDA needs to establish new nicotine standards for combustible cigarettes. FDA has explicit authority from Congress to set low nicotine standards for cigarettes. The Family Smoking Prevent and Tobacco Control Act (FSPTCA) allows FDA to set “tobacco product standards,” including provisions for “nicotine yields of the product” where such standards are “appropriate for the protection of public health.” With a mountain of evidence showing that combustible cigarette addiction can lead to cancer, heart disease, and death, FDA should have no problem proving that nicotine standards for combustible cigarettes are appropriate. FDA may have a harder task trying to show that nicotine reduction standards for other tobacco products are “appropriate for the protection of public health.” As one commentator noted, if the nicotine in combustible cigarettes declines, addicted smokers might switch to other nicotine-containing products, including smokeless-tobacco products, e-cigarettes, and e-pipes. Currently, no study has conclusively shown that smokeless tobacco products are safe or unsafe. Some studies suggest that smokeless tobacco products may lead to smoking later in life, while other studies show that smokeless tobacco may be helpful for smokers hoping to quit. Assisted Suicide and Lethal Injection: FDA’s Regulatory Dilemma? Two weeks ago, California’s legislature approved a bill that would make California the fifth, and largest state to approve assisted suicide. If Governor Jerry Brown signs the bill, California would join Oregon, Washington, Montana, and Vermont in permitting physicians to prescribe life-ending medications. California was one of 36 states that considered assisted suicide legislation this year. Though none of the bills have become law, the assisted suicide, or “Death with Dignity” movement seems to be gaining strength. If assisted suicide becomes legal in California, whether and how patients will have access to assisted suicide is a different matter. Secobarbitol and pentobarbital are the most commonly used medications in assisted suicide. Pentobarbital, the cheaper of the two options and the preferred drug of choice, is facing a drug shortage. Pentobarbital is also used in capital punishment, and U.S. suppliers have stopped producing the drug because the suppliers did not want to be associated with lethal injection. The drug shortage has left some patients considering assisted suicide to go through back alleyways to obtain pentobarbital. Indeed, the Death with Dignity movement is facing many of the same issues that state corrections agencies are facing in obtaining access to lethal drugs. None of the drugs used for assisted suicide or lethal injection are FDA-approved for a lethal purpose. Both groups have faced challenges in importing the drugs from other countries because FDA cannot accepting an imported drug if it appears to violate Food Drug and Cosmetic Act. Both groups have, in some cases, resorted to compounding pharmacies to manufacture lethal drugs from raw materials. Last week, the Department of Health and Human Services (HHS) Office of Civil Rights (OCR) released a proposed rule implementing section 1557 of the Affordable Care Act (ACA). Section 1557 applies the Rehabilitation Act of 1973 to the ACA so that a covered entity cannot discriminate against an individual on the basis of a disability in any health program or activity. The proposed rule clarified how OCR intended to enforce and interpret section 1557’s nondiscrimination provision. As Timothy Jost and other commentators have noted, the government’s proposed interpretation of section 1557 significantly expands the number of health entities that need to meet the Rehabilitation Act’s nondiscrimination requirements. The regulation proposes to encompass all entities that operate a health program or activity, any part of which receives federal financial assistance. 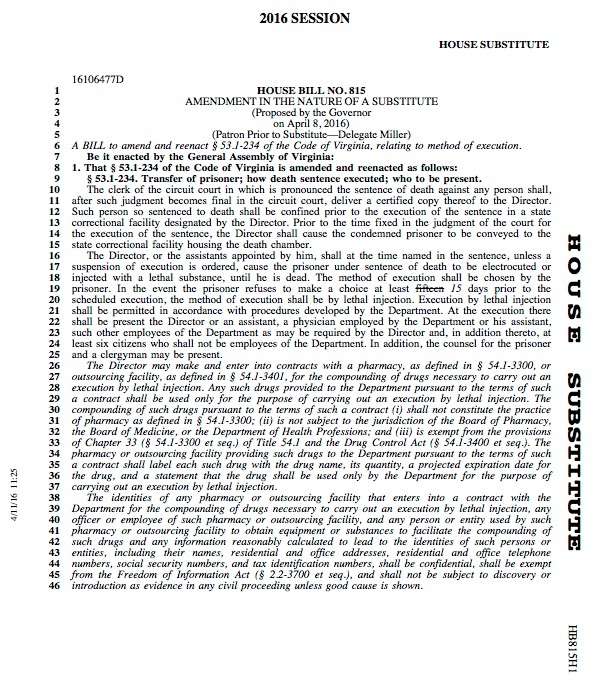 The regulation then broadly interprets “federal financial assistance” to include “subsidies and contracts of insurance.” Thus, an insurer receiving premium tax credits or cost-sharing reduction payments through participating in a health insurance Marketplace would need to ensure that all its health plans meet the Rehabilitation Act’s nondiscrimination requirements, regardless of whether the plans are sold through the Marketplace, outside the Marketplace, or through an employee benefit plan. This broad interpretation means that the Rehabilitation Act’s nondiscrimination provisions will now apply to a number of previously excluded plans.